When you go into a business to discuss providing coffee service they are expecting you to be the expert. 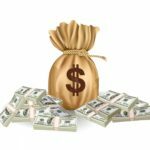 Knowing the various products your company provides, the prices, equipment you use, and all the basic business info is standard. What info will show them you are truly the expert? Here is some info to help you become more of an expert. Tea is the most widely consumed beverage in the world next to water and can be found in almost 80% of all U.S. households. Unlike other beverage, over 159 million Americans will drink tea served hot or iced, anytime, anywhere, for any occasion. The most popular tea in the United States is black tea. Before WWII black and green tea were equally popular. Green tea was imported primarily from Japan. During the war people started drinking more black tea because it was more available. Today the most popular tea in America remains black tea. Tea has been a popular beverage in China for almost 3000 years. It was introduced to Japan around 600 A.D. and to Europe and the Americas in the 1600s. Other beverages also bear the name “tea”, including herbal teas such as mint tea, ginger tea, chamomile tea, hibiscus tea, and many others. These are technically not true teas as they do not contain the tea plant. The term “herbal tea” is a generic term applied to hot water infusions made from any plant(s). Click for more info on Herbal Teas and Infusions. 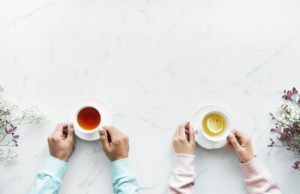 Are there any negative health issues associated with drinking tea? Over-consumption of caffeine seems to be the only issue with tea itself. This does not include the wide variety of things often added to teas. Some herbal “teas” contain no actual tea or other caffeine sources, making them caffeine-free. The caffeine content of tea varies widely from one tea to the next making it impossible to make a general statement about caffeine content. Nor can you accurately state which tea, green, black, white, or oolong, contains the most or the least caffeine. The caffeine content in the leaves, any other parts of the plant used and the type of processing used all influence the final caffeine content. Some roasted teas are very low in caffeine. Teas containing more leaf buds tend to contain more caffeine, whereas teas made of mature leaves and stems tend to contain less caffeine. It is a widespread myth that black tea contains the most caffeine of any tea. 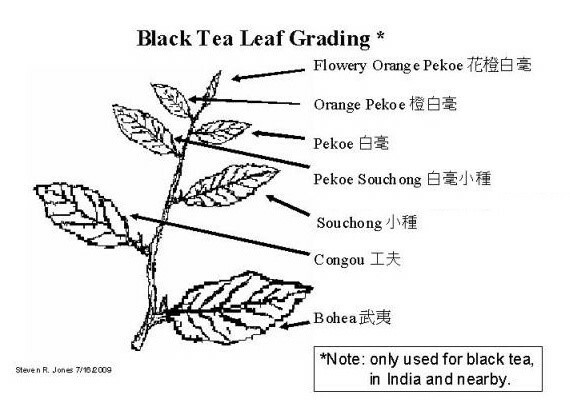 Black teas made of larger, more mature leaves can be very low in caffeine. Some black and green “tippy” teas deliberately use more leaf buds to produce a high caffeine tea. Irish Breakfast and other strong blends deliberately use these to create a high caffeine beverage. Caffeine content develops in brewing. Longer steeping times and using more leaf both result in a higher caffeine content. Ways of brewing tea that result in a stronger tasting cup usually result in greater caffeine extraction. The method of preparation includes tea concentration, a whole bag for a cup versus a few bags diluted to make iced tea by the gallon. Teas are good sources of antioxidants. Antioxidants deteriorate with time. Tea should be consumed within a year of packaging. White tea has the most antioxidants. Tea leaves have been used in traditional Chinese medicine and other medical systems to treat asthma (functioning as a bronchodilator), angina pectoris, peripheral vascular disease, and coronary artery disease. Drinking green tea for diabetes is recommended. The ability to help sensitize cells improves their capability to metabolize sugar. Green tea lowers blood sugar levels and helps curb obesity making it one of the best teas for diabetes. Tea contains the antioxidant polyphenols, which reduces stress and widens the arteries. This aids in reducing cholesterol and decreasing blood. Polyphenols also regulate glucose which controls diabetes. Black tea is also shown to help in preventing Type 2 diabetes. This highly fermented brew converts the simple flavonoid compounds to complex compounds. Interesting research into tea bioactivities show catechin from Camellia sinensis has been shown to act against PPARgamma, a nuclear receptor that is current pharmacological target for the treatment of diabetes type 2. The beverage we know as tea is made almost exclusively from the leaves of Camellia sinensis or Camellia sinensis var. assamica. Kukicha (twig tea) is also harvested from Camellia sinensis, only it uses twigs and stems rather than leaves. Varying levels of oxidation achieved via processing procedures produces white tea, yellow tea, green tea, oolong, pu-er tea and black tea. 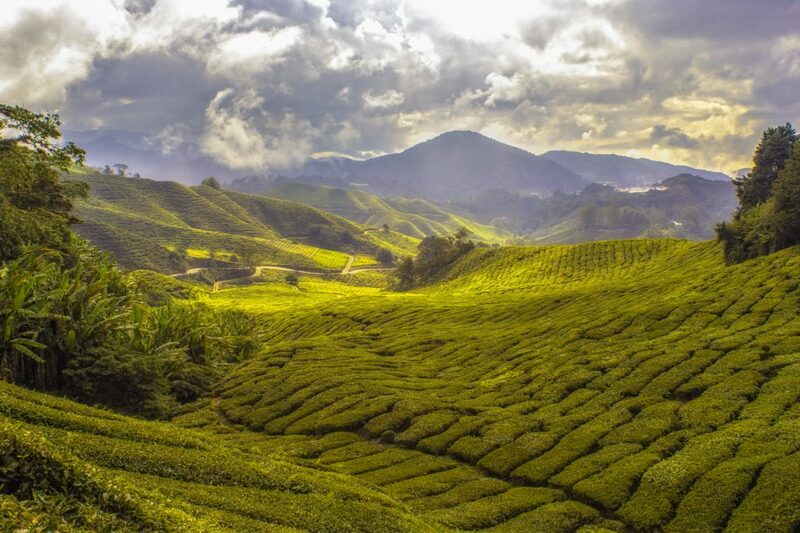 Assam, Darjeeling, and Nilgiris are tea producing regions in India. Ceylon tea is tea from Sri Lanka. Earl Grey tea; a blend of teas infused with bergamot oil, an oil from the bergamot orange rind. Charles Grey, 2nd Earl Grey and British Prime Minister commissioned a Chinese tea merchant to create a tea blend for Howick Hall, Northumberland, because of the high concentration of lime in the water. English Breakfast tea; a high fired leaf blend with a dense, sweet malt and honey flavor. Jasmine, Mint, Ginger, etc…; a tea with add flavor ingredient(s). Pu’er (Puer or Puerh) tea; a raw tea not subjected to heat processing. Living microbes are retained causing it to age like wine. Bancha; a popular, but not high-quality Japanese tea made from coarse leaves. Cardamom, cinnamon, clove, saffron, ginger, lemongrass, mint and fennel seeds are often added for flavoring and perceived health benefits. Tea is a perennial monoculture crop. This evergreen shrub or small tree originated in northern Burma, then spread to China, India and over time throughout the world. Now grown on over 2.71 million hectares or 6.7 million acres in the mountainous areas of the tropics and subtropics between latitudes 41° N and 16° S in more than 34 countries. A major commercial crop with an annual yield of 3.22 million metric tons of processed tea worldwide. A tea bush may be harvested for 40 to 50 years (in some cases special trees have kept producing up to 100 years). Harvest involves plucking only the terminal bud and the 2 or 3 leaves immediately beneath it. Around 75% of the world’s tea production is black tea, which is produced by drying, macerating, and “fermenting”, or facilitating the oxidation of, the leaves. Called “fermentation” yet this process does not involve microorganisms, except in pu’er tea. Green tea production, which is concentrated in China and Japan, does not involve a fermentation process. Oolong or Wulong tea is partially fermented. Tea Oil; a sweetish seasoning and cooking oil obtained by pressing the seeds of Camellia sinensis and Camellia oleifera. Tea Tree Oil; an essential oil that should not be confused with tea oil. Tea tree oil is used for medical and cosmetic purposes and is toxic if ingested by mouth. It comes from the leaves of the Australian tea tree, Melaleuca alternifolia. Hope this assortment of tea facts comes in useful in demonstrating your expertise and impressing your clients.